For a perfect social app you can use this iPhone 6 mockup that is being held up by a man hanging out with his buddy. The man is holding the white iPhone 6 in landscape view. His friend is sitting to the right. 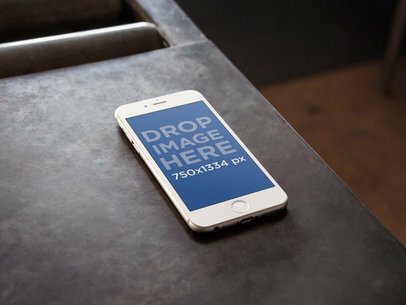 The iPhone 6 mockup holds an image of 750x1334px. This is a great place for a social or casual app. 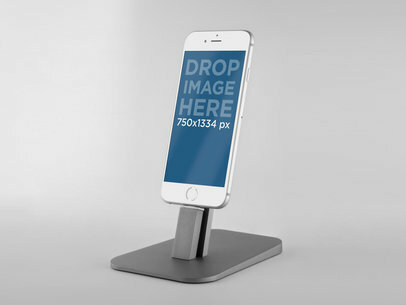 You can use this white iPhone 6 mockup on a metal stand to show off your app. It is set against a classic white background. 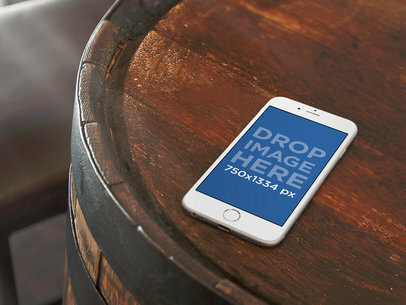 The iPhone 6 mockup is set to portrait view and holds an image of 750x1334px. This will work well for any type of app. It would be especially fantastic for apps with a modern design. Need a little extra focus for your app? 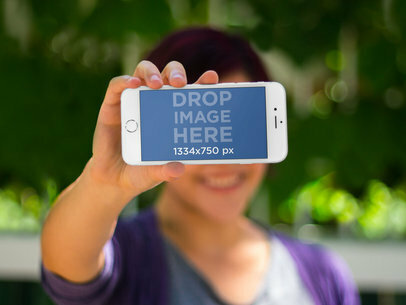 Use this iPhone 6 Plus mockup held up by a woman in a coffee shop. The iPhone 6 Plus is being held up in landscape view. The woman sits across from her friend at a coffee place. The iPhone 6 holds animage of 780x1080px. 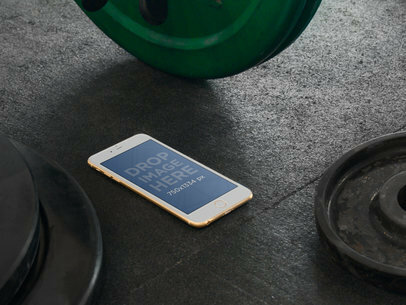 With this Gold iPhone 6 on a gym floor you can show off your new workout app. They iPhone 6 lays on the dark gray gym floor. Around it are various weights. The iPhone 6 holds an image of 750x1080px. 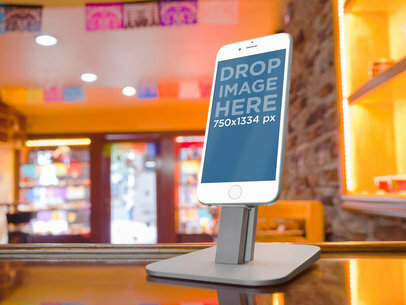 Use this iPhone 6 mockup to market your app in a small business setting. The iPhone 6 is being held up as a credit card is being exchanged to pay. They are at a small store with knick knacks lining the background. 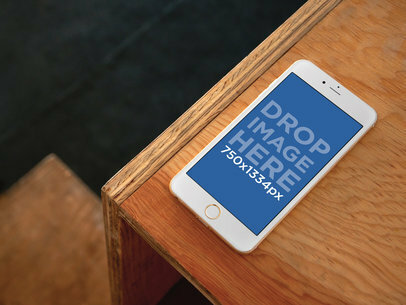 The iPhone 6 mockup holds an image of 750x1334px. This is a great place for a finance app. More Mockup Templates here! 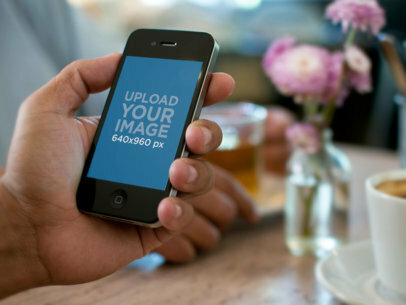 Market your app in this iPhone 6 mockup laying in portrait view at a cute teashop. 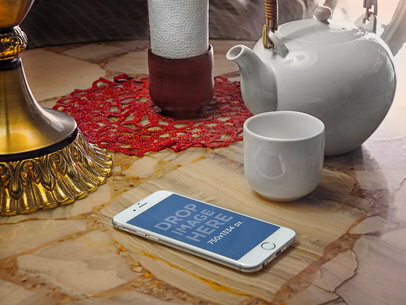 The white iPhone 6 lays in portrait view below a white vintage style teapot and cup reminiscent of Beauty and the Beast. 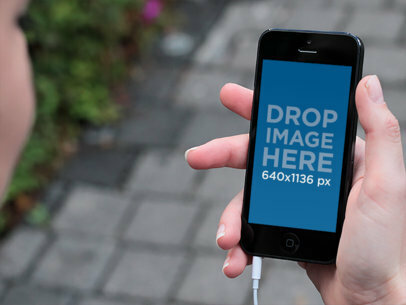 You fit an image of 750x1334px in this iPhone 6 photo-realistic mockup. You can show off a great vintage style design. This would be perfect for a social app to share your favorite places. 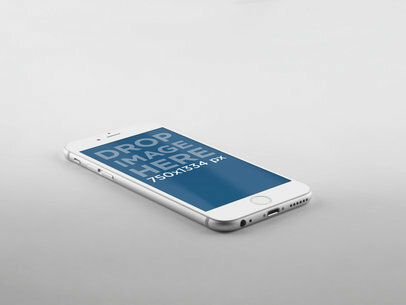 This minimalist iPhone 6 mockup is a great place to show off any app that needs a polished setting. The iPhone 6 floats over a grey backdrop at a slight angle. It looks as if it was falling through space. The iPhone 6 holds an image of 750x1334px. This neutral backdrop will work well with an app. This white iPhone 6 mockup is the perfect place for a construction app or for DIY app. The iPhone 6 rests on a dark metal table. The iPhone 6 holds an image of 750x1334px. The dark work table provides great contrast for the white iPhone. This is a great place for an eclectic style app. 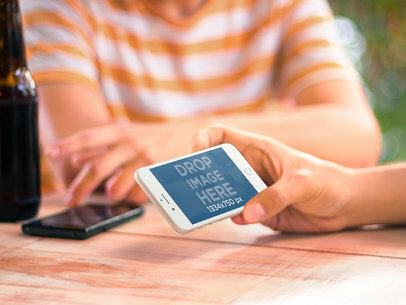 This is an amazing iOS mockup which features two young men hanging out, they are best friends and one of them is holding a white iPhone 6 in portrait position while he browses a social or entertainment app that could be yours! 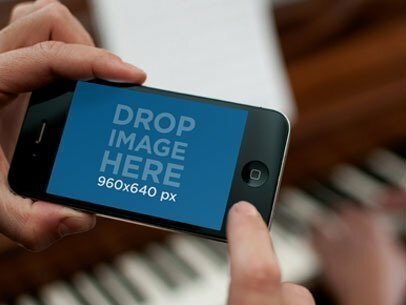 Use iPhone mockups as a part of your app marketing strategy. 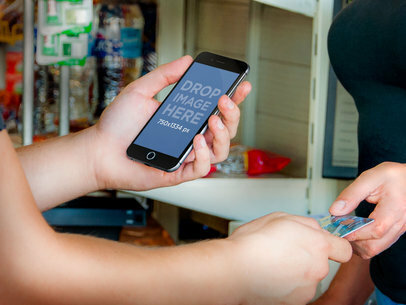 This iPhone 6 mockup is perfect for a small business app or baking app. The iPhone 6 rests on it&#8217;s grey stand on the counter of a bakery. The iPhone 6 mockup is white and the bakery is colorfully decorated. The iPhone is in portrait view and holds an image of 750x1334px. A pretty girl smirks as she holds up her iPhone 6 to show it too you. The iPhone 6 is in landscape view. It holds an image of 1334x750px. 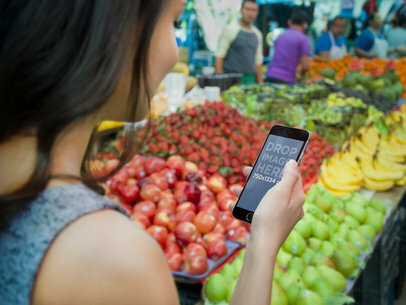 Your mockup will look perfect against the brick background and purple clad girl. This stage will work for any type of app. The perfect setting for any shiny new app is this white iPhone 6. It is set on a white and grey backdrop to give your app a sleek classic look. The iPhone 6 is laying in portrait view and will hold a mockup of 750x1334px. Show the distinguished nature of your new iOS app by featuring its design and features in this template on the screen of a gold iPhone 6 in portrait position. The simple lines in this image do well to subliminally alert your clientele to the straightforward results they will get from frequent use of your product while the wood brings a warm that piques memories of time spent outdoors. 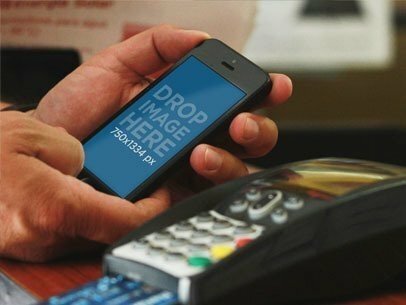 After one look at your app or mobile responsive website featured in this image, clients will be ready to buy. Simple and versatile: as is your product, so should be its mockup template. Let's get started! 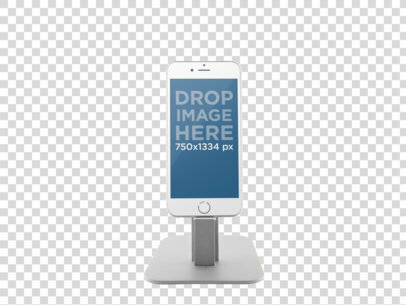 See how wonderfully this image will highlight your work by dragging and dropping a screenshot onto the iPhone's screen or clicking "Grab Screenshot From URL" above the image and typing a URL when prompted. 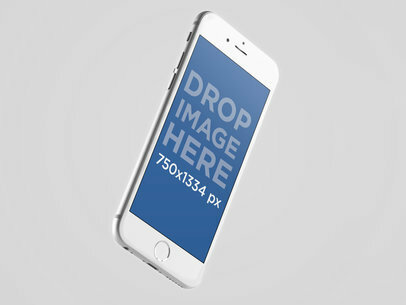 Show off your great new app mockup in this white iPhone 6. The iPhone 6 is perched atop its sleek grey stand in portrait view. The background is grey. The iPhone 6 will hold and image of 750x1334px. It is the perfect place for any equally sleek app design. A man quickly types on an Apple keyboard, as an iPhone 6 mockup lays next to him. His desk, a mid-tone brown, hints at the iMac monitor right above him. You can drop any image in portrait mode to start using this iPhone 6 stage. Showcase your app on the latest devices with Placeit! Do you have an app for swash buckling pirates? Maybe this will work for you. This iPhone 6 mockups rests on top of a wooden barrel. Sunlight streams in from the top left of the image. The iPhone 6 holds an image of 750x1334px and sits in portrait view. The warm chocolate tones in the stage make it perfect for dark green or contrasting bright blue. A fun, interesting iPhone 6 mockup. 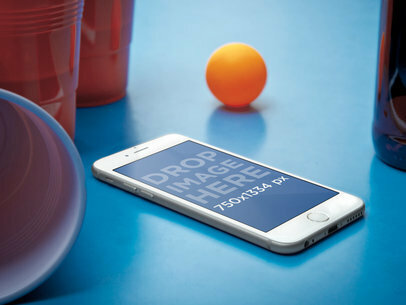 The white iPhone lays on a ping-pong table. The blue color of the table vs the orange of the ball and the red cups makes for a very vivid scene. 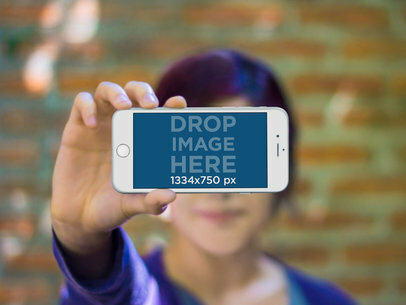 Drop any image in portrait mode to get started. A smiling woman hold up her iPhone 6 for you to see. The iPhone 6 is set to landscape view. It holds an image of 1334x750px. She is standing outside on a sunny day. The background shows bright foliage. This is the perfect place for a photography app mockup or a cool game.